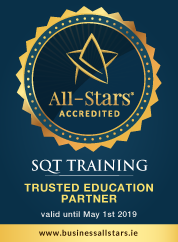 Many of SQT’s programmes have national and international recognition through a range of accreditations which are outlined below. SQT were proud to become a member of HECA (Higher Education Colleges Association) in 2014. HECA is the recognised voice of independent higher level education in Ireland. HECA’s main focus is on representing the independent third level sector by ensuring the highest standards of quality amongst its members. QQI (Quality and Qualifications Ireland) is a state agency established by the Quality Assurance and Qualifications (Education and Training) Act 2012 with a board appointed by the Minister for Education and Skills. The agency has replaced the Further Education and Training Awards Council (FETAC), the Higher Education and Training Awards Council (HETAC) and the National Qualifications Authority of Ireland (NQAI) and incorporates the functions of the Irish Universities Quality Board. SQT programmes which have been validated by FETAC and HETAC are now awarded by QQI. QQI is responsible for the external quality assurance of further and higher education and training (including English language provision) and validates programmes and makes awards for certain providers in these sectors. QQI is also responsible for the maintenance, development and review of the National Framework of Qualifications (NFQ). The National Examination Board in Occupational Safety and Health (NEBOSH) offer a comprehensive range of globally-recognised, vocationally-related qualifications designed to meet the health, safety, environmental and risk management needs of all places of work in both the private and public sectors. The Association of Energy Engineers (AEE), founded in 1977, is a non-profit professional society of over 15,000 members in 84 countries. Since its inception in 1981, the Certified Energy Manager (CEM®) credential has become widely accepted and used as a measure of professional accomplishment within the energy management field. It has gained industry-wide use as the standard for qualifying energy professionals both in the United States and abroad. The Food Safety Preventive Controls Alliance (FSPCA) is a broad-based public private alliance consisting of key industry, academic and government stakeholders whose mission is to support safe food production. The FSPCA has developed a nationwide core curriculum, training and outreach programs to assist companies producing human and animal food in complying with the preventive controls regulations that will be part of the Food Safety Modernization Act (FSMA). CIEH are a campaigning organisation, who aim to promote improvements in environmental and public health policy. The organisation are a registered charity and the professional voice for environmental health; setting standards for the education of members and EHPs. CIEH provide information, evidence and policy advice to local and national government, environmental and public health practitioners in the public and private sectors.